Thanks to the continuous advancements in dentistry, patients can get the oral health care they deserve without anything that can get in the way. This phenomenon is made possible because of the introduction of sedation in dentistry. With the availability of several options, patients with special needs can undergo a particular dental procedure with ease. The term laughing gas was coined due to the euphoric-effect it causes once inhaled. Its medical name is Nitrous Oxide. Aside from being an effective means for comfort in dentistry, it also helps during childbirth. Many find it ideal since there is no need to use needles for this option and it has no side-effects. 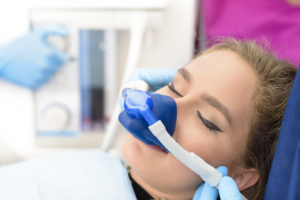 To provide a safe dosage for patients, laughing gas is usually mixed with oxygen when delivered. For dental purposes, the ratio used is 70% oxygen and 30% nitrous oxide, while for medical it is often 50/50. The sedation has five stages that the patient will experience: lightheadedness, tingling sensations (arms and legs), feeling warm, euphoria, and sleepiness. Believe it or not, laughing gas has its uses in the food industry. The gas is used as a propellant for cooking sprays and puffs bags of potato chips to prevent them from being crushed. At Shawn A. Walls, DDS, aside from offering dental services to cater to the needs of our patients, we are also committed to making their experience as pleasant as possible. That is why we chose to offer laughing gas. To know more reasons why we prefer the said sedative, read on below. After it is administered, patients can expect that it takes effect quickly. What’s more is, as soon as they are allowed to breathe in normal air, the results fade as fast. The sedative is supposed to make patients feel comfortable without making them fall asleep. While the dentist works, the patient remains relaxed and responsive at the same time. It is highlighted that nitrous oxide is safe when appropriately administered. Do know that our dental professional at Shawn A. Walls, DDS will carefully use the said sedative to make sure that our patients will get the dental care services they deserve. Do you feel more confident in scheduling your dental appointment with the help of Laughing Gas in Johns Creek, GA? We at Shawn A. Walls, DDS got your back! For more queries about the said sedative, feel free to call or visit us at 10700 Medlock Bridge Rd., # 202, Johns Creek, GA 30097.